Tento produkt v poslední době nakoupilo již 62 zákazníků. The Logitech® PC Headset 960 USB features a comfortable and lightweight headband for all day wear, with in-line controls for volume and mute adjustment. The boom microphone can be adjusted to the optimal position for clearer conversations. The noise-cancelling microphone filters backgound noise, and rotates out of the way when not in use. Ships in a business pack ideal for system builders, integrators and value-added resellers. * Stylish, adjustable over-the-head design for a comfortable fit that won’t slip off. * Ultra-soft earpad, flexible and lightweight design ensures all-day comfort. * USB cable for simple, plug-and-play connectivity. * Adjustable boom microphone for precise positioning; the microphone rotates out of the way when not in use. * In-line volume or mute controls for easy and precise control. * Microphone mute indicator light tells you when mute is enabled. 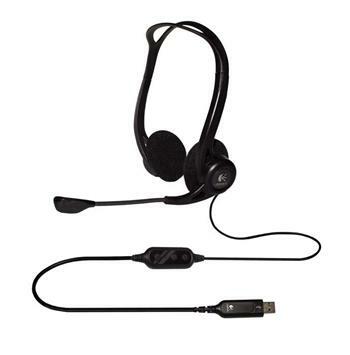 * Advanced digital USB delivers superior stereo sound quality. * Noise-canceling microphone filters background noise for clearer conversations. * White-box business packaging is easy to ship, store and recycle.